This blog includes all sorts of info on Istanbul, other parts of Turkey as well as other destinations worldwide. It also includes my thoughts and feelings about general issues and more. If you want to follow me by email, just write in your email address below. 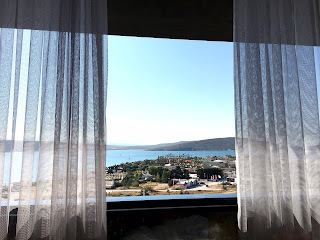 If you haven't had a chance to read my previous post, I was in Alaçatı, Çeşme on the glorious & pristine Aegean coast of Turkey during the 1st 9 days of August. 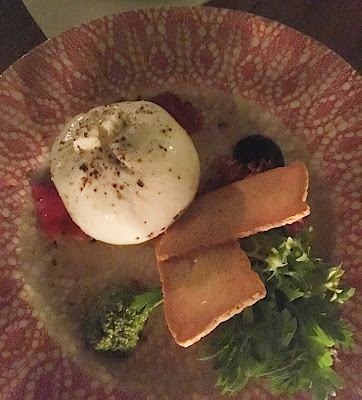 I shared the names and info on the hotels I stayed at and now it's time to give you info on where I went to eat in the evenings! I'm sorry to say you might be disappointed that the list is short, but quite frankly I'm not! 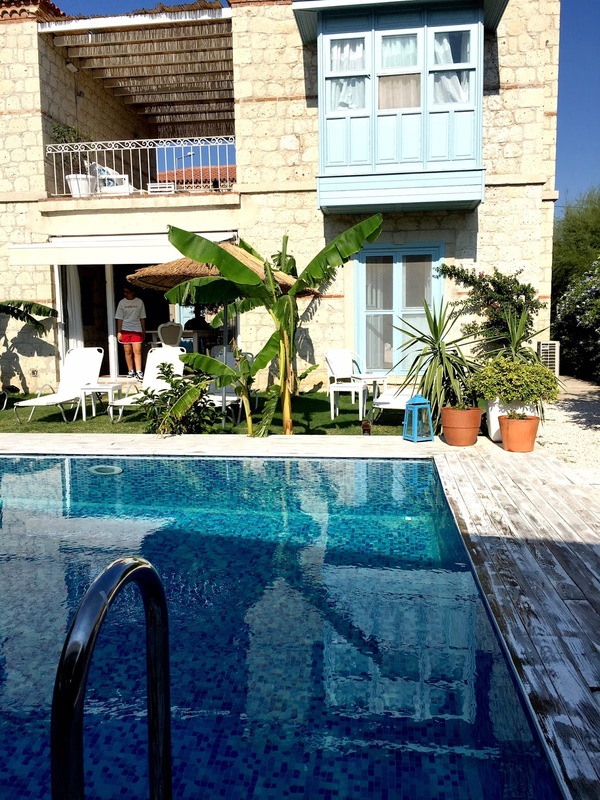 Although I was in Alaçatı for 8 nights, on a few occasions I was invited to the summer homes of my family & friends where we just hung out and had some great food prepared at home by my hosts! Although I only visited 3 restaurants for dinner on this vacation, I'm happy to say that I was very happy with our meals and feel free sharing the info with you (otherwise I wouldn't!). So... here goes! 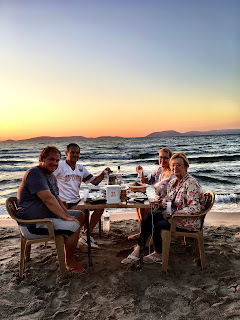 Although I was extremely wiped out the day I arrived in Alaçatı, while we were hanging out and having wine & cheese on the terrace of The S Alaçatı with my sister, brother-in-law and his childhood friend Okan (my brother-in-law has a lot of childhood friends in Çeşme because he was born in Izmir and spent his childhood in this resort town)... Okan asked if we were hungry at around 7:00pm. Upon saying yes, he said "how about going for 'rakı-balık' at a 'salaş' or 'no frills' fish restaurant right on the water and you can go just the way you are?". This was a offer hard to say no to and that's exactly what we did! We didn't have to change and get all "dolled up" which was definitely an extra plus! We arrived about 30 minutes before the sunset and although it was a Tuesday night, Okan called and made a reservation for us just to be on the safe side and thank god he did because it didn't take long for all the tables to fill up! 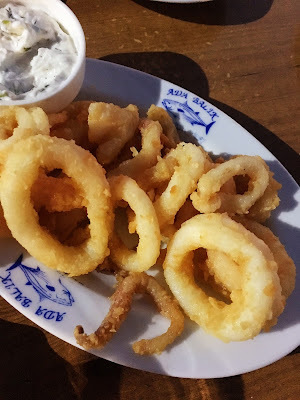 This family owned and managed fish restaurant has been around for 24 years and this is the first time we are coming here (except Okan - he goes often and I understand why!). It is definitely "no frills" with plastic tables and chairs and dinnerware dating back 20 years, but the view and delicious food more than makes up for it! 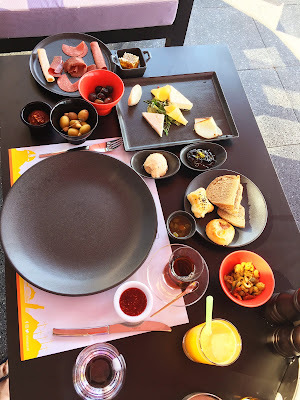 Just before the sun set, we had ordered a variety of cold meze (appetizers) from the refrigerated display in the indoor section of the restaurant. 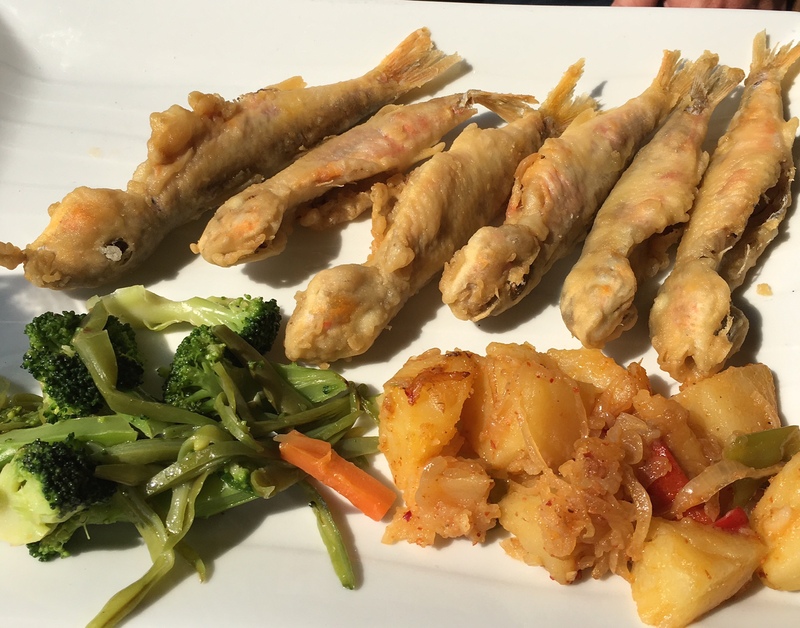 To translate "rakı-balık"... rakı is the Turkish version of ouzo but not as sweet and it's the most suitable "partner" for a meze and balık (fish) meal in Turkey. Of course you can have wine or a soft drink, but it's just not the same! 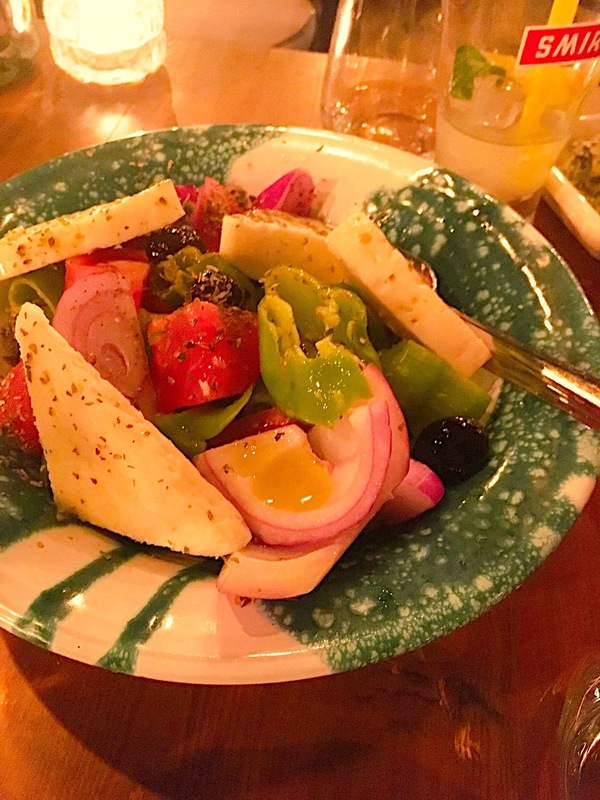 Then we ordered a çoban salatası (shepherd's salad) followed with 2 hot meze: sauteed spinach & chard topped with yogurt sauce and fried calamari. 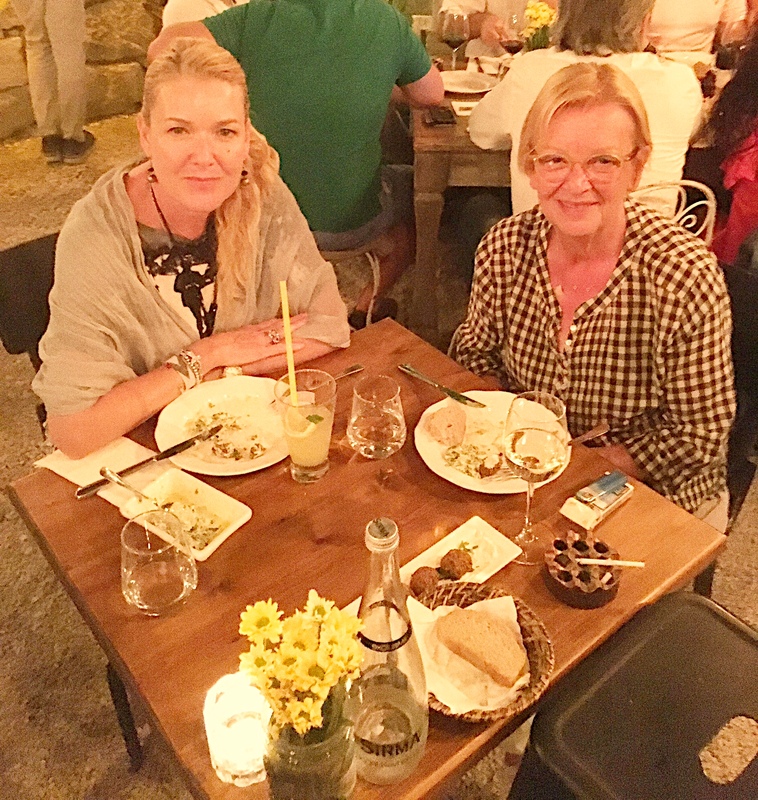 It might not look like we ate a lot of food, but by the time you add the wonderful toasted bread, the rakı to wash it down with and the great conversation... we did! 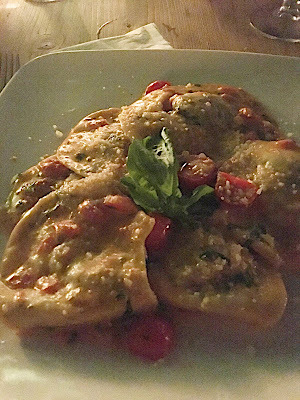 Everything we ate was absolutely delicious, in season and the flavors and seasonings just right. 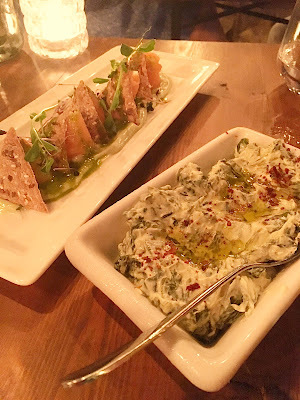 I was particularly impressed with the spinach/chard combo because I love greens and although a very simple dish, this healthy meze definitely appealed to my taste buds! 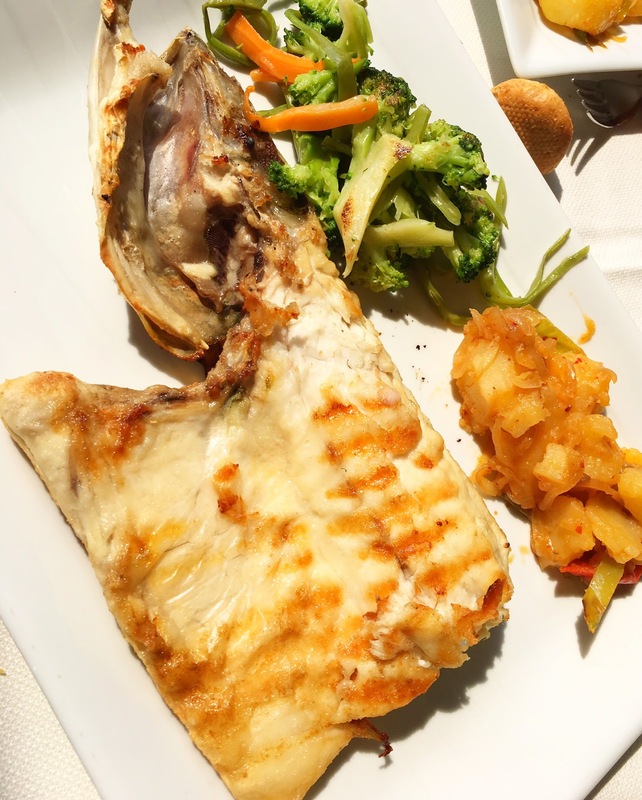 One of the problems in a majority of the fish restaurants in Turkey is that there is no menu! So, you basically have to ask the waiter the cost of your food beforehand if you don't want any surprises... especially if you are ordering fish because the price changes daily. They also charge küver or a cover per person which includes bottled water and bread and here it was 4 TL/person (quite reasonable compared to most places that charge as much as 10 TL/person). Also, check your bill, but in a majority of cases, the tip called servis in Turkish is not included and a 10% tip of the total bill is the norm. It was a fantastic first night in Alaçatı to say the least... After a relaxing several hours in good company, it was time to return to my hotel. It was nice meeting you Okan and thank you for your recommendation! By day this restaurant doubles as a "beach" and you can pay a minimal charge for an umbrella and chair to sun. Breakfast is also served. Reservations are recommended. On the 2nd night of my trip to Alaçatı I was invited to a dear friend's home for wine and cheese which turned into dinner at her home. Kapari Bahçe opened in 2014 and I had stayed at the Kapari Hotel the same year and wrote about both places which you can read about in my previous blog posts. The hotel's owner is also a partner at the restaurant, hence the name. I've always enjoyed the food here and you can't tell from the picture, but it is a large eatery on 3 levels (didn't want to take too many pics with customers to disturb them). We were lucky enough to get a table for two because it was quite packed and we hadn't made a reservation, but it was later in the evening around 10:30pm. In all the times I ate at Kapari Bahçe, I don't ever remember having a main course because their appetizers are so varied and so good, I never had room to eat more! 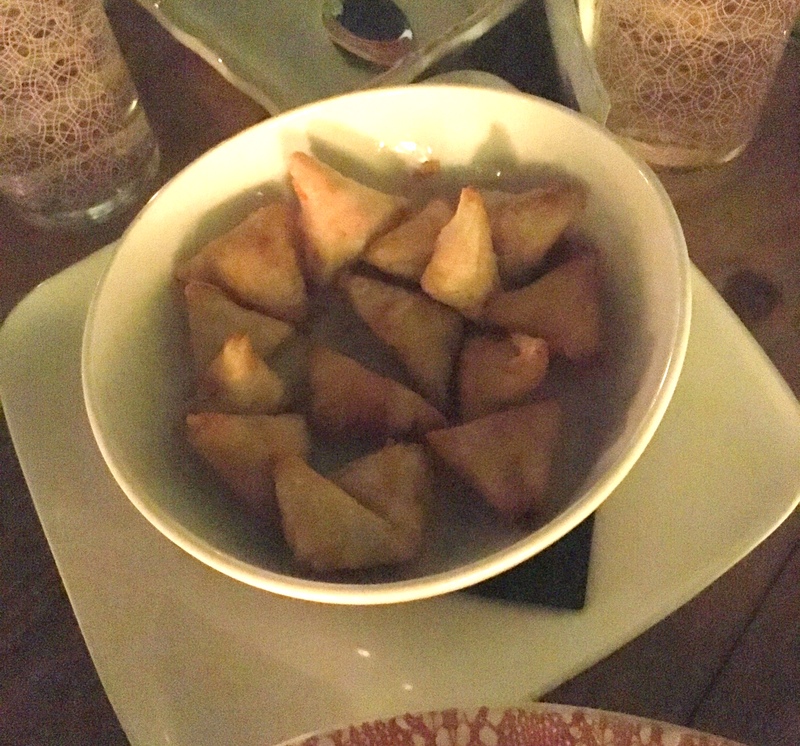 The presentation of both dishes was quite intriguing and the tastes were as appealing as their presentations. 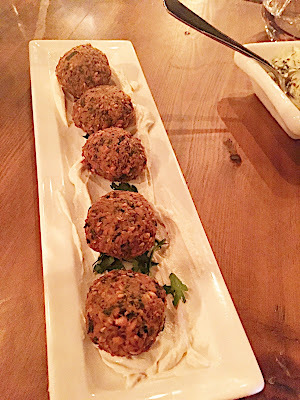 The Falafel was good, but I would have preferred garlicky tahini sauce a la Lebanese style instead of the yogurt sauce served to give the dish a little more kick. 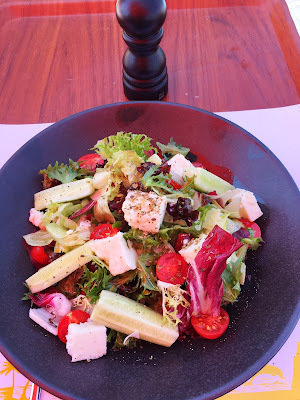 I can't begin to tell you how incredibly delicious this salad was! It was crisp, the veggies super fresh (like they just picked the tomatoes, peppers and cucumbers from the garden) and the olive oil salad dressing just right! Once again, another successful evening with great food and company! I'm not going to mention prices here because they will probably change next year and I don't want to mislead anyone. The menu is quite extensive with hot & cold appetizers, pasta, main dishes and desserts. The wine list is quite impressive with local and international favorites and quality wines by the glass are also available. 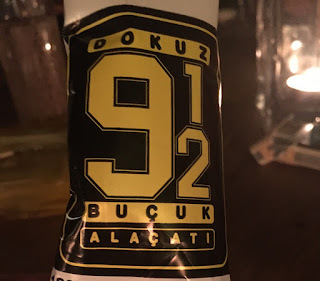 The day after my birthday, we got together with the friends we were going to meet the night before and went to a newcomer called Dokuz Buçuk Restaurant & Bar or 9 1/2 off the main street in the Hacımemiş area and away from the major crowds. 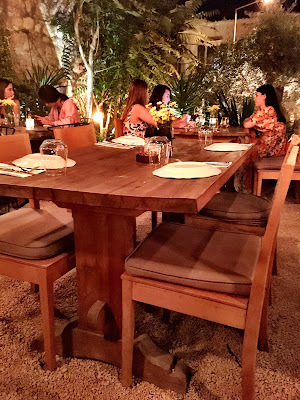 The dimly lit beautifully decorated restaurant is in a lovely alcove with lots of verdant trees and a variety of different decorative objects strategically placed around the restaurant. 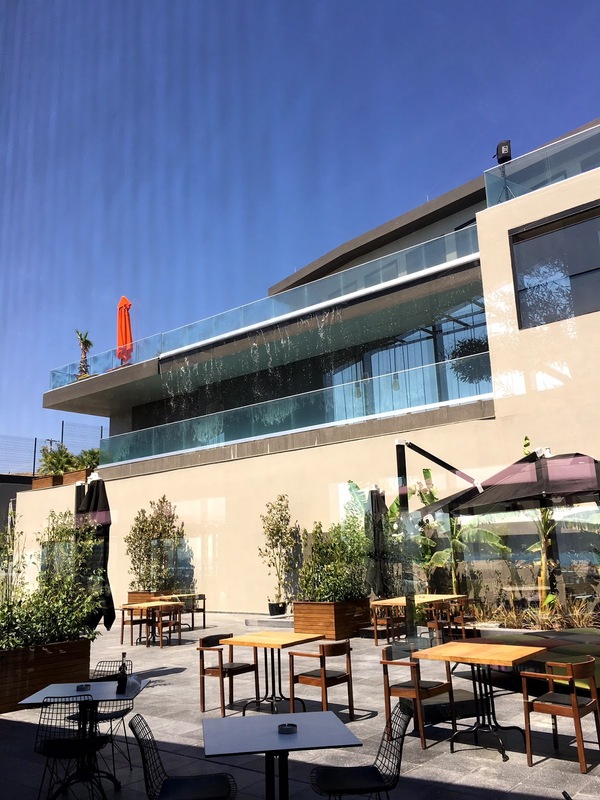 Open only since May 2017, the restaurant is "new", but not the name... in it's heyday in the 1980s and 1990s, Dokuz Buçuk apparently was a very popular disco in Izmir and one of the partners from those days opened this eatery this season in Alaçatı. The menu (as much as I can recall as in my rush, I forgot to take a photograph of it) includes a good selection of appetizers, salads, pastas and main courses - both Aegean cuisine and international. This appetizer was good, but nothing to right home about and didn't leave a lasting impression with us. First, I was surprised at the size of the portion for an appetizer because normally the meatballs are bite-sized, but these were normal portions of köfte and I must say, there were absolutely yummy and the perfect combo with the red onions, tomatoes and green peppers - very "Turkish style" to say the least! 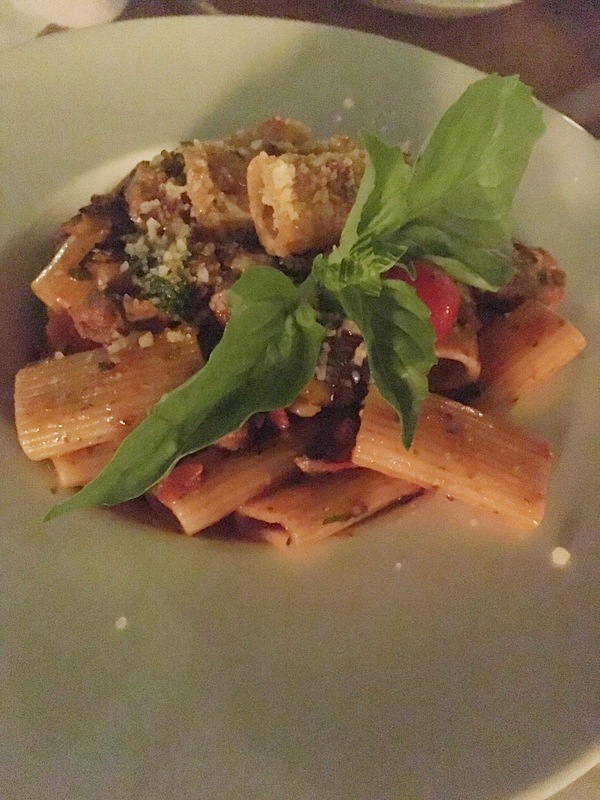 My friends, sis and brother-in-law opted to order pasta as main courses ... and they were very happy that they did! They said the dishes were cooked to perfection (al dente) and very good, but what I also noticed was that the portions were also quite generous and prices modest compared to other "like" restaurants. A refreshing change because most of the time, the portion is small, but the price high! Of course, we washed down all these yummy dishes with a local sauvignon blanc by Isabey Vineyards which complimented our meal perfectly! During dinner, the DJ played music that wasn't intrusive and not too loud so we comfortably had a conversation without screaming. However, after 11:00pm, he pumped up the music, so we moved to the bar to continue our evening. Unfortunately the music had to be turned down by 1:00am and the place emptied out because of the noise ordinance in Alaçatı. Another glorious night on the town in Alaçatı was had! 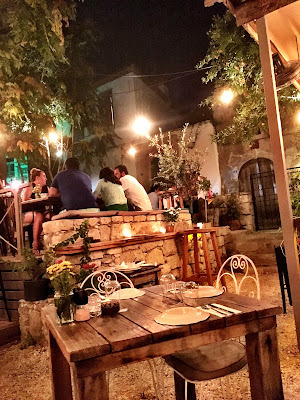 In conclusion, I only had a chance to visit 3 restaurants for dinner during my last trip to Alaçatı, but each was a success and worthy of a write up. 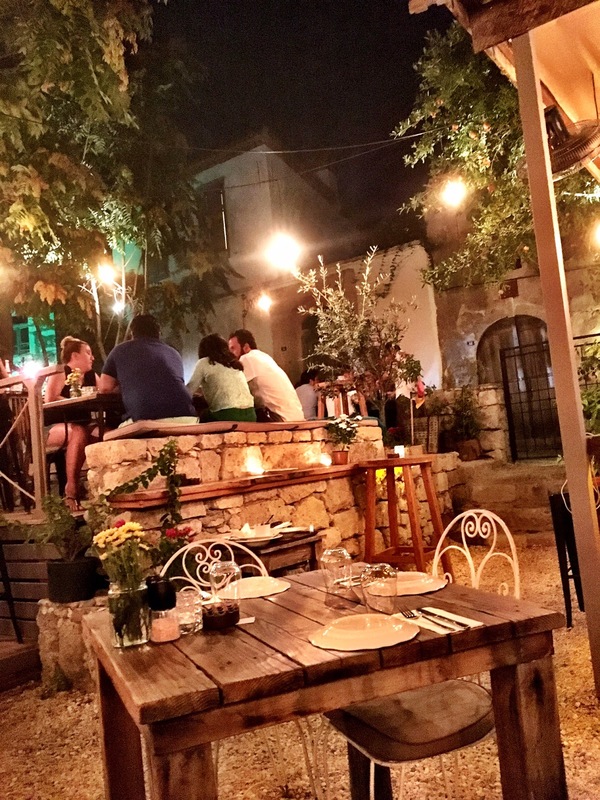 I'm happy to see that Kapari Bahçe is continuing to do so well season after season; Fethi'nin Yeri Ada Balık has proven itself for the past 24 years and I'm sure newcomer Dokuz Buçuk Restaurant & Bar will be around for many years to come! Bon Appétit! 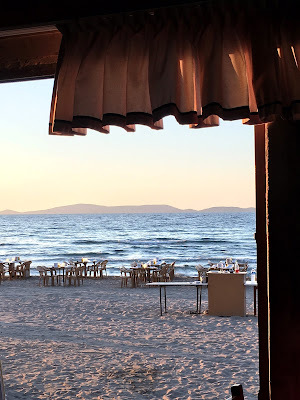 My final blog post which I will prepare in the next few days will be about the Beach Clubs I visited during this trip to Alaçatı - two are my old time favorites and two are new places I visited for the first time this season. After a whirlwind 8 nights and 9 days in Alaçatı, a district in Çeşme along the Aegean coast and 45 minutes drive from the "Pearl of the Aegean" Izmir, I returned to Istanbul exactly a week ago today! 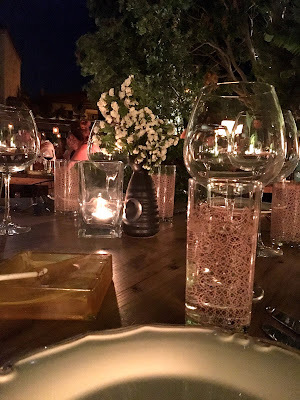 Since I have the habit of burning the candle on both ends during a vacation, I'm just getting my legs back and finding time to write about my wonderful vacation! Of course, it has taken me days to organize all my photographs and I'm not done yet. But, since I will divide my posts into 3 parts (where I stayed, where I ate and beach clubs)... at least I can start! Up until 2014, I used to go to Alaçatı every summer since 1999! But I gave a break in 2015 and went to Lisbon instead and last summer I didn't go on vacation because I had started a diet which I was serious about (and lost 17 kg), so a summer vacation was a no-no. Alaçatı has changed in the past 3 years: mainly, new hotels have opened - big and small; some restaurants & bars have closed while others have taken their place (maybe just for the season) and new beach clubs said hello to Alaçatı. During this trip, for the first time I stayed at two totally different hotels. This was totally by choice because I wanted to "experience" Alaçatı at a "deluxe" property and then a "typical" boutique hotel. Arriving in Alaçatı on August 1st... my first hotel was the "spanking new" The S Alaçatı overlooking the pristine Aegean Sea, Windsurfers Schools and about 1 km from the Port Alaçatı Marina. 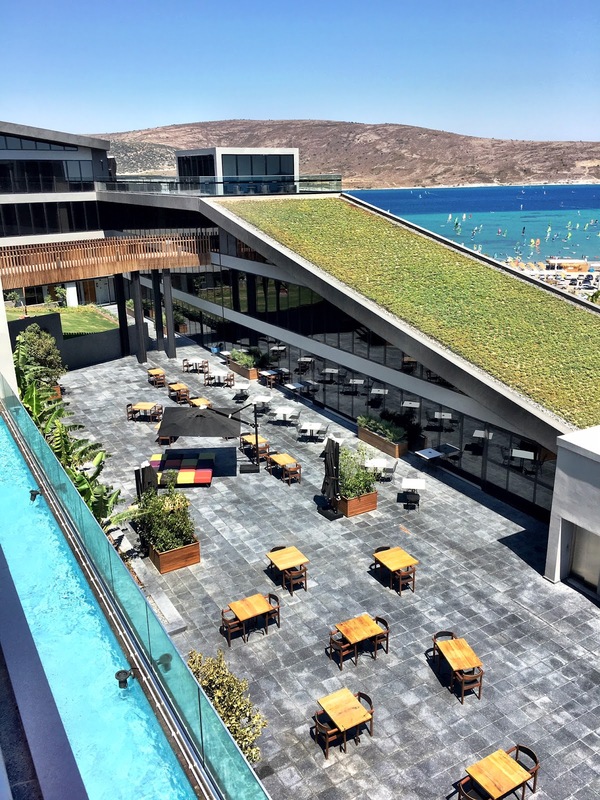 A member of the Ascend Hotel Collection and Choice Hotels, The S Alaçatı opened in June 2017 and it's still a "work in progress". Upon completion, there will be a total of 132 rooms (128 standard rooms of which 112 with sea views, 3 suites and 1 room for the physically disabled). While I was there 70 rooms were complete and my room was on the 3rd floor. All the minimalist decorated standard rooms are approximately 20 square meters with a super comfortable queen sized bed; satellite TV; shower stall; coffee/tea set-up; minibar with soft drinks only (currently complimentary); name brand toiletries; digital safety deposit box; and free WI-FI (throughout entire hotel). What I really also loved was the floor to ceiling sound-proof windows that can be electronically opened half-way down. The lobby area is also very elegant and includes the reception desk and right next to it is a bar and indoor & outdoor seating areas for breakfast, lunch, snacks, etc. Breakfast is available daily between 8:00am and 1:00pm and includes a very wide selection of hot and cold breakfast treats... Since "breakfast" is my personal favorite meal of the day, I did go to town a bit more than when I'm home. The following is just a sample of the open buffet selections and doesn't include the cheeses, deli meats, etc. because I couldn't get a "good" picture. Besides what's on display, you can also order all sorts of eggs cooked to order; and fresh fruit juices,coffee & tea are all included in the BB price of your room. After a wonderful breakfast, I decided to hang out at the hotel because I was invited to a friend's house for wine & cheese at 5:00pm and it didn't make sense to go a beach club. So, I changed and headed to the hotel's swimming pool to get some "rays" for the first time this season! 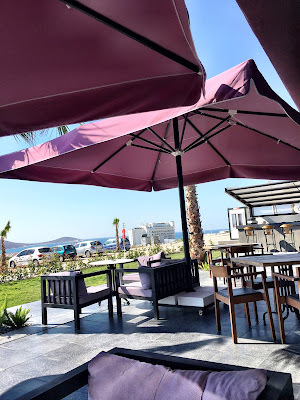 My sister, brother-in-law and nephew came over afterwards too and we had a wonderful few hours overlooking the Aegean Sea in the tranquility of the hotel's pool area which is accessed from the 3rd floor. 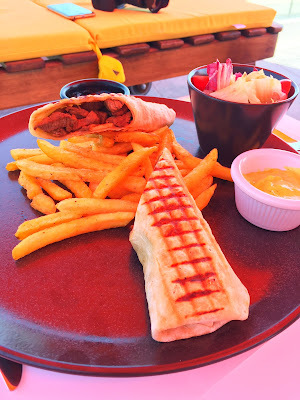 While sunning, we also decided to try a few snacks and obviously my 16 year-old nephew ordered a grilled tenderloin of beef sandwich with a side of fries while my brother-in-law opted for the hotel's version of a Greek Salad... both were very delicious and reasonably priced for a hotel. I stayed at The S Alaçatı Hotel for 5 nights and totally enjoyed my stay. Like I said, it is a brand new hotel and from time to time there were some hiccups, but nothing major and easily solved. Since the hotel is still a "babe in the woods", by next year the sprawling landscape around the hotel will be totally verdant;all the guest rooms will be completed; a fine dining restaurant overlooking the Aegean Sea on the upper level terrace will open; and the posh spa will be totally operational. Some additional general info: Besides the pool on the 3rd floor, there is also an 115 square meter "Infinity" pool; the Lobby Bar & Lounge is open 24 hours; Room Service is available 24/7; at the spa & wellness center there is a sauna, Turkish Bath and indoor swimming pool; there is a fitness center and Yoga & Pilates Studio; and 3 meeting rooms. I must add that I was "comped" for my stay because the hotel is owned and managed by my brother-in-law's childhood friend. I had the opportunity to meet Nuri and his lovely wife Özlem a few years ago and we became good friends. I would like to thank Nuri for his hospitality and wish him lots of success as The S Alaçatı adds a new prospective to the Alaçatı hotels in the area... it is upscale, contemporary with a minimalist airy and fresh decor, excellent friendly & knowledgeable staff and caters only to guests over the age of 15! Can't wait to visit again next year! On Sunday, I moved from The S Alaçatı to my second and final hotel: Evliyagil Hotel by Katre which is located in the outer rim of Alaçatı where numerous boutique hotels are lined up side by side and in walking distance to the Hacımemiş area which is chock full of trendy & chic restaurants, bars, etc. 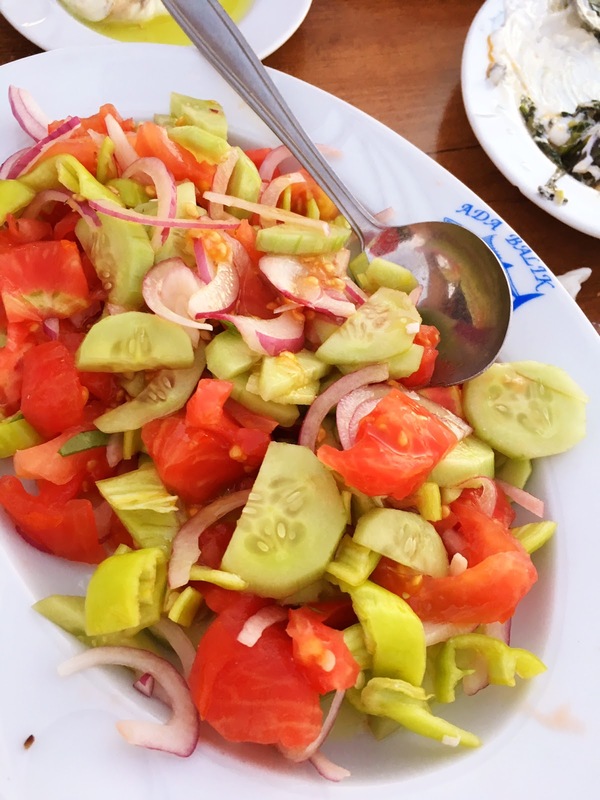 The hotel is also steps from Alaçatı's Open-Air Market set up on Saturdays with vendors selling all sorts of vegetables, fruits, foodstuffs and casual apparel. 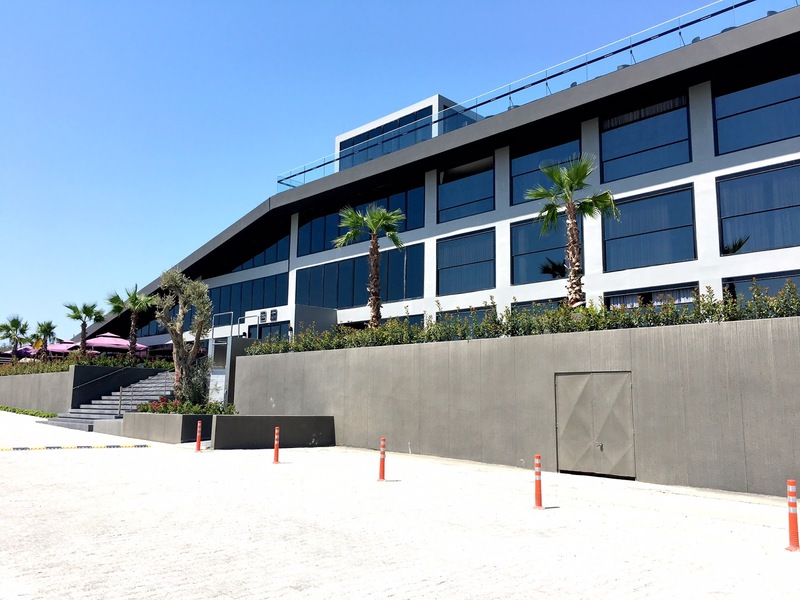 After closing Katre Hotel, Figen took over the management of the Evliyagil Hotel this year and thus the hotel's new name. This 2-story hotel is a typical Alaçatı B&B boutique hotel with it's architecture and decor and has a total of 10 guest rooms. My room was on the 1st floor and overlooked the pool and dining area. My room was about 20 square meters with high ceilings, a small TV, minibar, A/C, name brand toiletries, safety deposit box and free WIFI. After a lovely welcome by Figen, my sis and I settled in the chaise lounges in front of my room to just relax on a lazy Sunday and catch up with Figen! 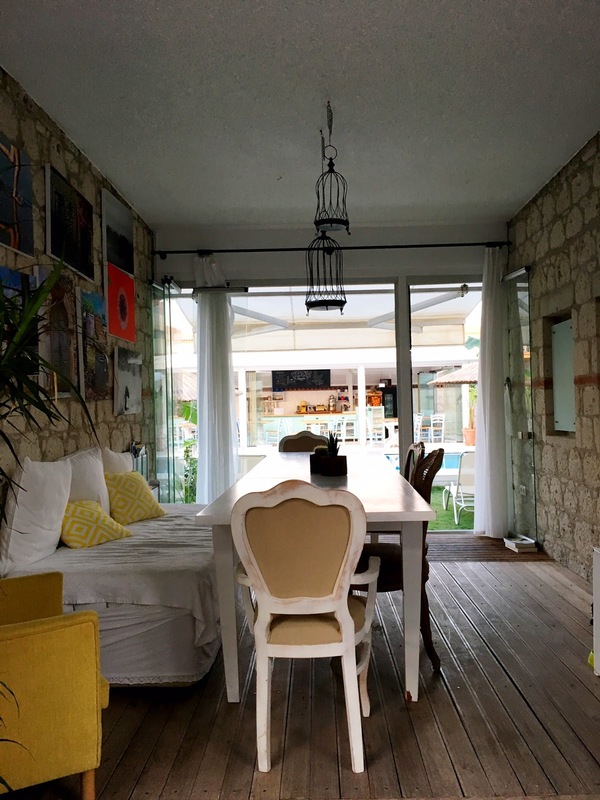 I knew I was going to enjoy my time here too because personally I do prefer boutique hotels from time to time because they are cozy and feel more like a "home". For example, on the afternoon I arrived, I just wanted a light snack and asked Figen if they could make me a white cheese and tomato grilled sandwich and voila! 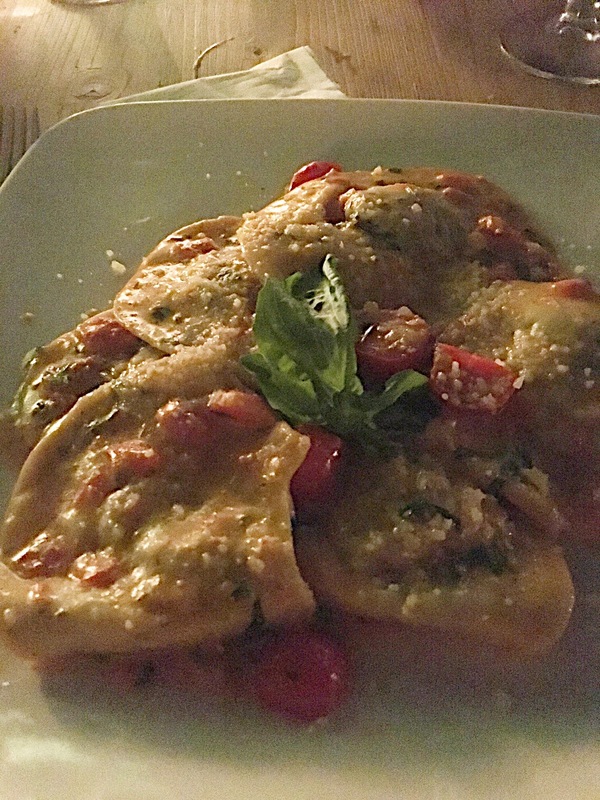 She added fresh basil and olive oil which was a nice extra touch! Also, this hotel allows pets so I can come another time with my Luka, just like I did the first time I stayed at Katre Hotel years ago. Katre Hotel has always been known for its excellent breakfast spread and I couldn't wait for the morning to sample the delectable delights I had missed! Their breakfast spread is so popular that non-guests often come just to sample the breakfast! Up bright and early... I sat down and waited for my breakfast to be served! First and foremost, everything is fresh and homemade. Just to give you an idea, the breakfast includes 3 cheeses, green and black olives, homemade jams (no sugar added), 2 types of tomato dishes, cucumbers, peppers, honey, clotted cream, fresh herbs salad with olive oil and crushed chestnuts, lor cheese with black currant sauce, butter, simit (Turkish style bagels with sesame seeds), breads and my favorite pişi! All are served with unlimited Turkish brewed tea. 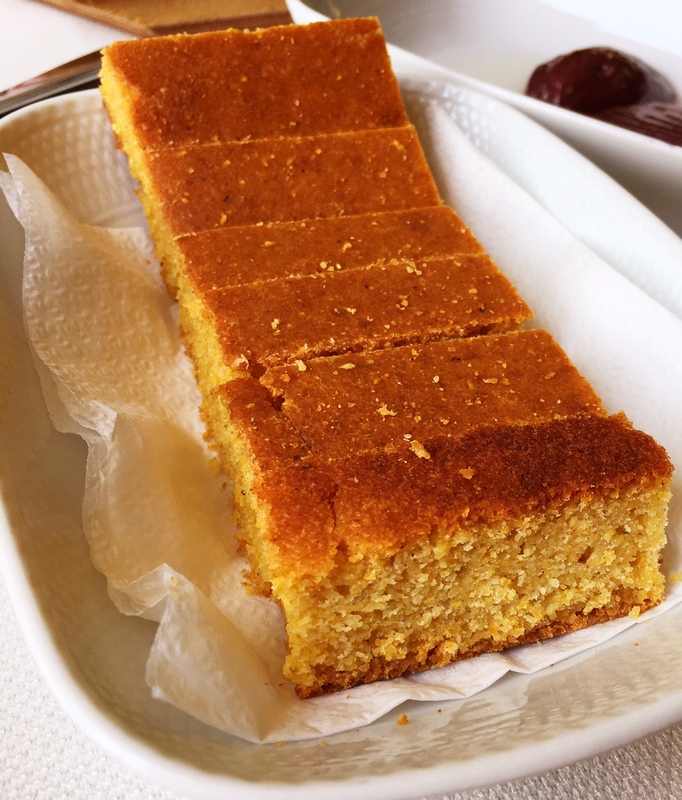 I've eaten pişi at other places in Alaçatı but the ones that Figen prepares are worth every decadent calorie! Simply, this delectable delight is deep-fried dough! That's it... but it tastes so so good! If you feel that this is not enough food for you, they also offer a la carte selections such as omelets, pancakes, gluten-free granola, and much more. Also, all sorts of fresh fruit juices, detox juices, coffees are also served. 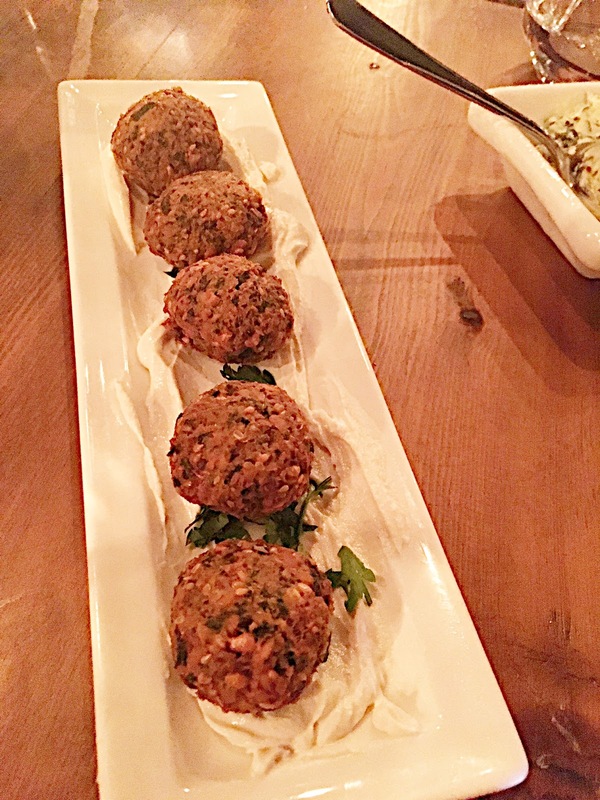 Furthermore, all day dining is available at Katre and the menu includes salads, burgers, mantı (Turkish style ravioli with meat and yogurt dressing), köfte (Turkish style meatballs), etc. 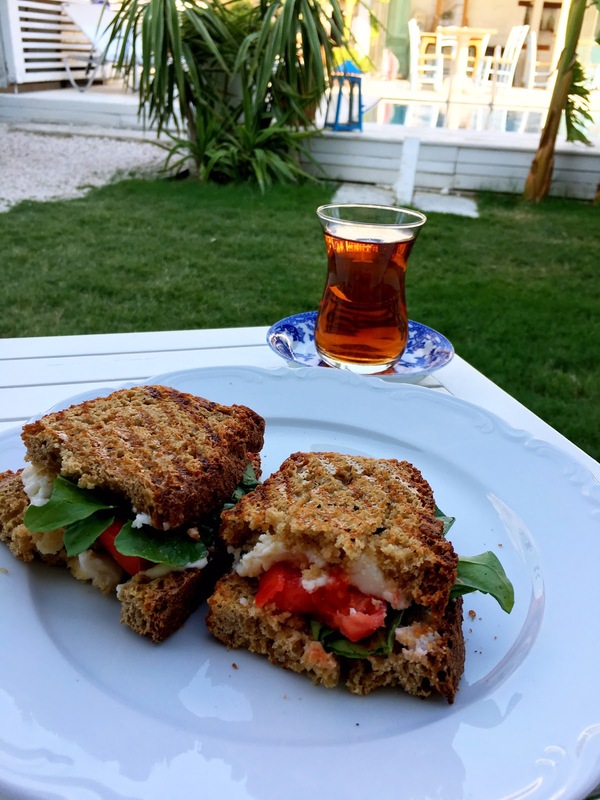 plus around dinner time, you can also expect to find some typical Turkish home-style dishes prepared by the kitchen according to fresh vegetables purchased. The bar menu includes cocktails, beers, scotch, etc. 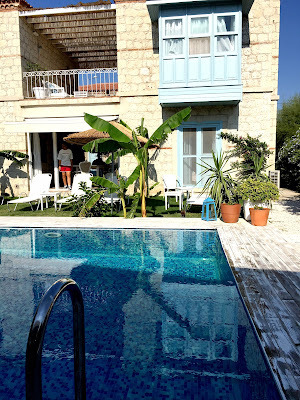 I stayed at Evliyagil Hotel by Katre for 3 nights and enjoyed every moment. Figen has a small staff of wonderful women working for her and her husband is her 2nd hand and is in charge of the front desk, music and pretty much anywhere else he is needed! Since we go back a few years, Figen did give me a discount off her normal prices, which I thank her very much for! So... my Alaçatı summer vacation 2017 included stays at two totally different hotels in different parts of town! I'm glad I did something like this because each one was a different experience and attitude! Since I'm a Leo and celebrated my birthday in Alaçatı, it suited my personality to a tee! 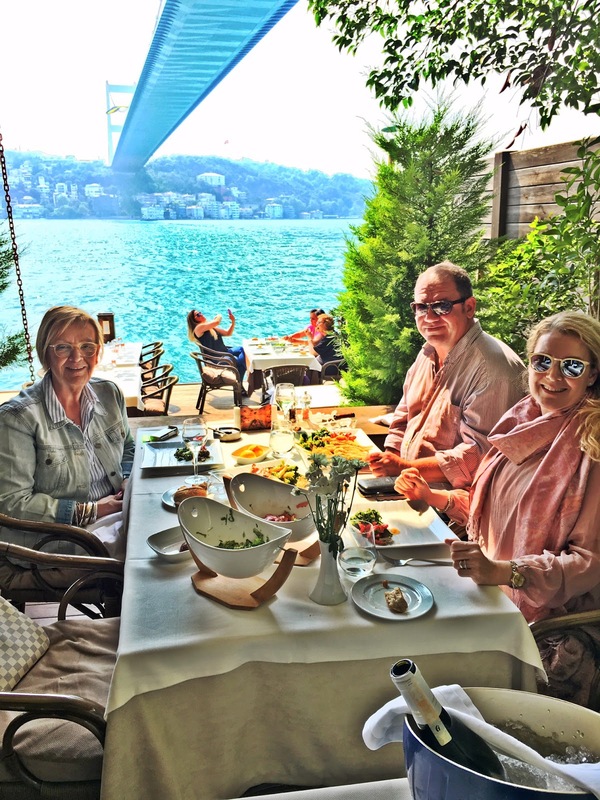 Uskumru Fish Restaurant: Fish Lovers Delight on the Bosphorus! Summer has been a little late in coming to Istanbul, but two weekends ago for the first time in a long time, the weather was gorgeous! On June 3rd, a Saturday, the sun was shining brightly and there was a light breeze with temps in the mid 20's (centigrade). The day before it was my brother-in-law's birthday and we decided to go to lunch at one of our favorite fish restaurants to celebrate... long gone are the days that we are "night owls" and prefer calm, quiet lunches with family or friends where we can hear each other talk and actually have long conversations! So, our fish restaurant of choice was Uskumru Balık (quite apropos as it means mackerel and balık means fish) along the Bosphorus shoreline on the Asian side of Istanbul in Anadoluhisarı (Anatolian Fortress). The boat ride is only about 5 minutes but once on the Bosphorus, you almost wish it was longer! On this particular day, I have never ever seen the Bosphorus so aqua blue that I felt like I was on the Aegean or Mediterranean Sea! 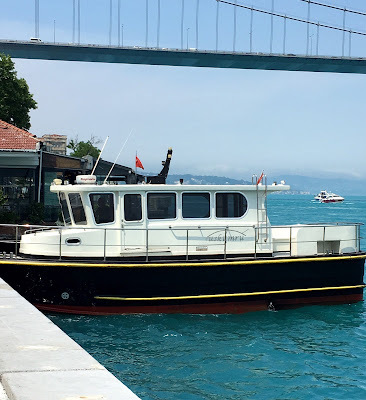 Apparently, according to the news, there is some scientific reason for this which I can't quite remember, but lately the Bosphorus has definitely changed "color"! I "discovered" this wonderful fish restaurant in 2014 when I was invited to a "ladies lunch" by one of my dear friends on another gorgeous sunny day in May and was very impressed with the location, food and service. Since then - this is my 3rd visit although I would like to go more often, but alas finding the time or budget to keep up with all the fine restaurants in the city is not possible. We opted to sit indoors as it was too sunny to sit outdoors. 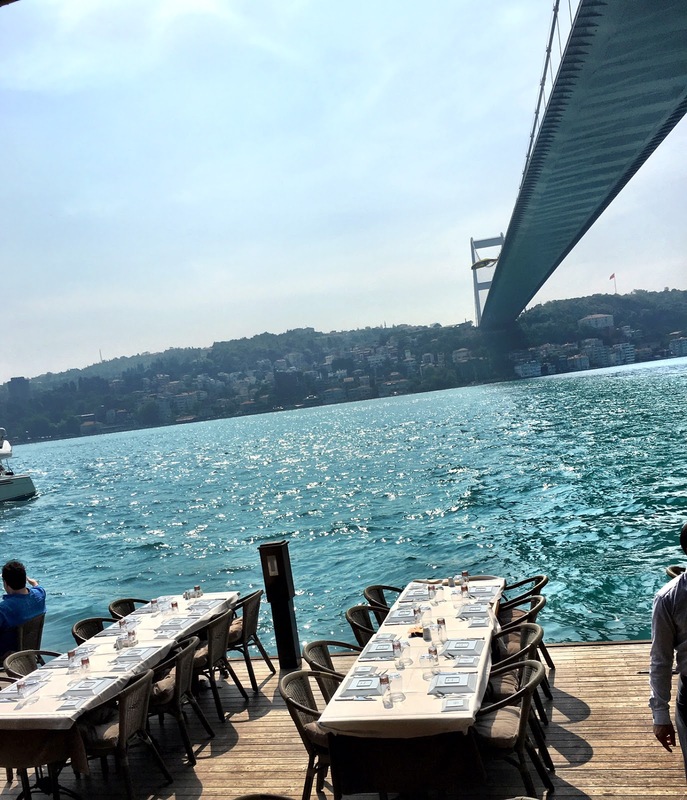 The restaurant does not prefer to use umbrellas because the Bosphorus can be windy and it could be hazardous if an umbrella topples over. 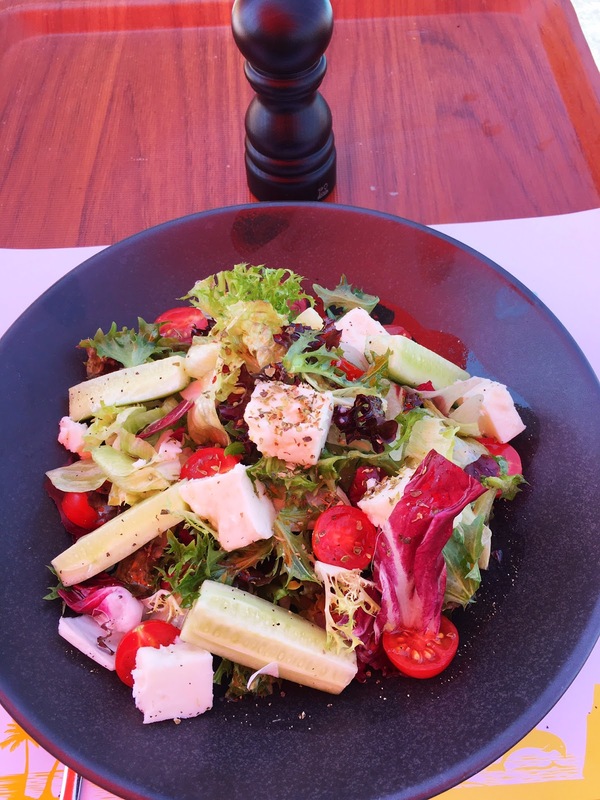 As before, we stuck to the "classics" served and started our meal with a very simple, yet incredibly delicious and super fresh (no need to add any additional dressing) finely chopped lettuce salad and tomato salad served in boat shaped plates to share. To accompany our salads, we only ordered 3 cold appetizers so that we didn't make the mistake we normally make and that is to fill up so much on appetizers, that we don't have room for a main course of fish! I'm always impressed that Uskumru's appetizers or meze are always so good - that they are properly seasoned and fresh! In other words, they are consistent. 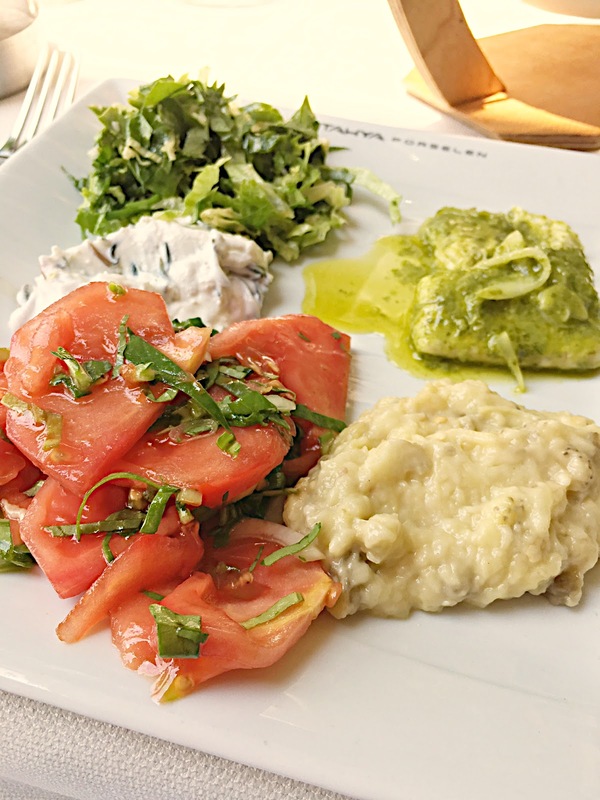 The eggplant salad (patlıcan salatası)just melts in your mouth... the sea bass with pesto sauce (pesto soslu levrek) has a "nice bite" and tingles your taste buds. And... for the first time we tried the sea bean (called ada fasulyesi in turkish and a bean I've tasted for the first time and it's very similar to glasswort) with yogurt, a very refreshing and light appetizer! After we combined all these delectable delights on our plate, it was time to chow down! I was patient and waited for the heated whole wheat rolls to arrive, but feel free to try the excellent, but fattening corn bread! What can I say? We were in food heaven! The sun was shining brightly, the Bosphorus was mesmerizing & glistening and several glasses of of ice cold white wine definitely lifted our spirits! We capped off our delightful birthday celebration with Turkish coffee and 1 slice of Havuç Baklava (havuç means carrot and so called because it's sliced to look like a carrot). Last but not least... most fish restaurant are not cheap! There is no menu to look at so basically, you don't know what the cost of the dishes are (unless you ask) until you get the bill, but if you are a "local", you have a "ballpark" idea on how much it will cost. Almost all have a per person coverage charge (called küver in Turkish) which includes unlimited bread and water (10 TL/pp at Uskumru). Most do not include the tip (called servis bedeli) in the check, but definitely look at the details if you don't want to double tip because some do (Uskumru does not). 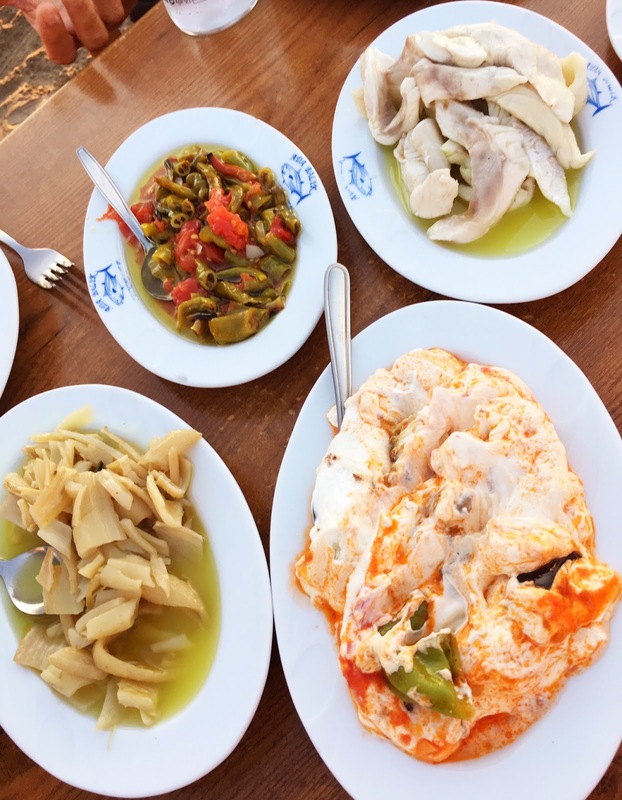 Since "rakı" (similar to arak or ouzo) is the typical "drink of choice" at fish restaurants, most wine lists are usually inadequate, price for quality high and most fish restaurants only carry one Turkish vineyards wines. But, all in all... find the fish restaurant(s) and there are plenty in Istanbul and experience eating fish "Turkish style". ON TO THE BOARDWALK.... we will be having some fun... ORTAKÖY! TURKISH BEVERAGE TREATS: How to make "Salep" from scratch and a good cup of Turkish coffee! TOI ISTANBUL: Delicious Food, Good Cheer! Hi everyone! My name is Vildan and Dani is my nickname... I was born in Istanbul, but lived in NYC for 30 years before returning to Istanbul in 1995. After 10 years at The Guide Magazines (Istanbul, Ankara, Bodrum), I retired from the media world and now work freelance as a translator/writerJanuary, 2011. I decided to start a blog in July 2011 and am having lots of fun writing about a wide variety of subjects. 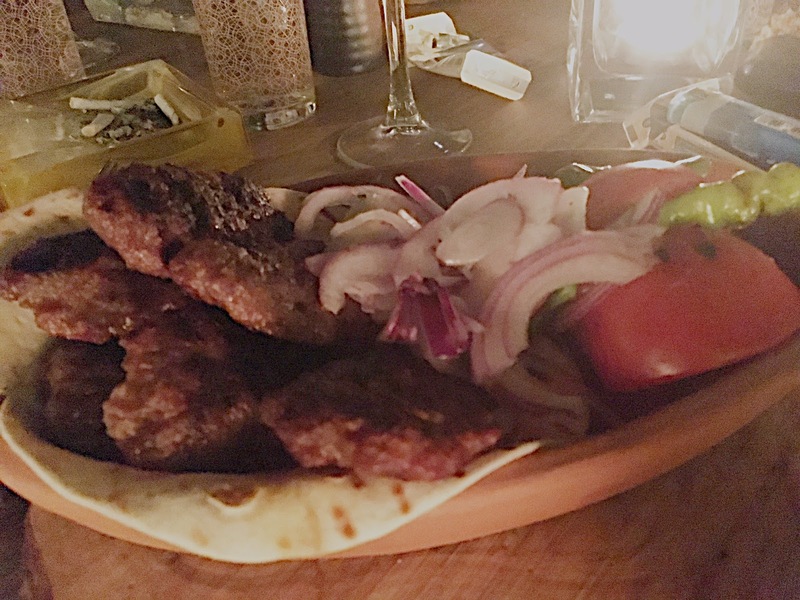 So much so, that I started another blog - written in the voice of my dog Luka.. Also, I am a major "foodie" and love trying new places! I have been a member of the Châine des Rotisseurs and Ordre Mondial (wine connossieurs group) since 2009 (Turkey chapter) Happy reading and I would love to get your comments! Luka is a maltese and was born in October 2010 & he's a real ham!! No portions of the text or images can be used without the written approval of the owner. Awesome Inc. theme. Powered by Blogger.